A screenshot from NASA's LSP Activity Book, a mobile app and online coloring book to spark interest about rocket launches in kids. The app was created by NASA's Launch Services Program. NASA has developed apps to track shooting stars and iPhone games to hunt comets, but its latest app is an educational project aimed at teaching kids all about rocket launches. 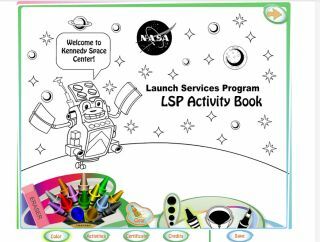 The agency's Launch Services Program (LSP) released the new free app called "LSP Activity Book" available for iPad and Android users. Kids can learn about the mission planning process and the precise measurements behind creating the right kind of launch vehicle. A character named "Peter the Payload" guides kids through the activity book that includes a series of pictures to color, word searches, mazes and matching games. The app also includes a no-bake "moon cookie" recipe. Kids can color 24 NASA-inspired pictures with their choice of 14 colors and several different coloring methods. Younger kids can use paint buckets to fill in the pictures while older kids can pick a freestyle coloring method with an adjustable pen size. A crossword teaches kids about the planets in the solar system and an "asteroid maze" mimics asteroid belts that spacecraft navigate. The app provides feedback when some activities are completed and kids can get a certificate of achievement once they "complete the mission" and make it through the whole activity book. Most of the NASA rockets launch from Cape Canaveral Air Force Station in Florida or Vandenberg Air Force Base in California. Other launch locations include Wallops Flight Facility in Virginia, the Kwajalein Atoll in the Marshall Islands in the Pacific Ocean and Kodiak Island in Alaska. The launch rockets that propel spacecraft beyond the Earth’s atmosphere range from about 55 feet (17 meters) long to 240 feet (70 m) long. LSP is also involved in education outreach and works with universities to launch small satellites called CubeSats for short-term missions and has sponsored robotics competitions at schools. LSP is based at the Kennedy Space Center in Florida. The Kennedy Information Technology Mobile Team developed the new app. NASA's LSP Activity Book is available for iPhone, Google Play and as an online coloring book that can be printed out. Follow Kelly Dickerson on Twitter. Follow us @Spacedotcom, Facebookor Google+. Originally published on Space.com.